These are prices for auctions of pre-made items. 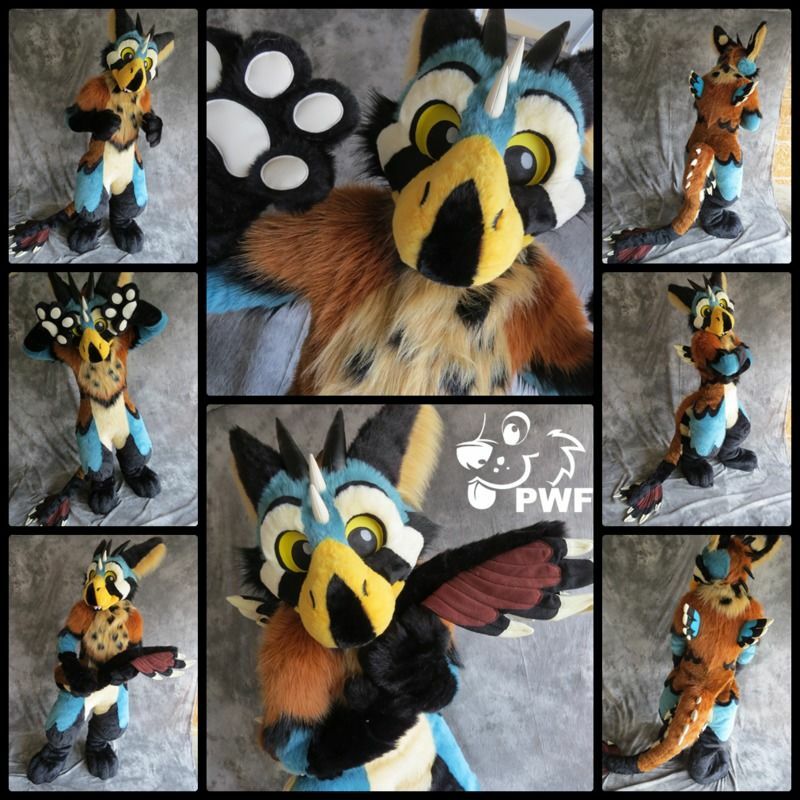 Direct custom commissions normally go between $2-5,000 for regular suits. Special/experimental commissions have been confirmed to reach a top price of $17,500. Higher priced items are in the works or unconfirmed. (I had an unconfirmed report of a suit over $18,000, which I believe may be a leather crafted item.) Outside of fandom, Hollywood special FX suits can add another zero to these prices. The auction’s success was definitely a surprise for me. I expected it to go well, but the end result was way over my expectation. I am extremely grateful and humbled by the support of the community, especially the final 2 battling bidders. I know there was some concern of the legitimacy of some of the bids. The $14,000 bidder commented wishing to retract his bid. I clearly had it stated in the auction that if you back out you are blacklisted from all my auctions so I contacted furbuy and they thankfully removed their bids for me. Besides that particular person I fully believe all the other bids were serious. I ended up talking with the final 2 bidders on skype and they were 100% serious. It seemed the entire fandom was on the edge of their seats watching the auction go on for hours after the original end time. There was a #thegreatphoenixwolfauctionof2015 tag going around on Twitter that was really entertaining. In the end TwilightSaint won the epic battle and I’m super happy for them. I hope other suit makers have this much success with their suits in the future. We’re pretty thrilled and impressed with the recent auction which closed at $11,575 – it was a very exciting moment and we had hundreds of people who were refreshing the page during the last hour or so of the auction waiting to see where it settled! The auction close time was extended several times by the final two bidders who were upping each other’s bids – we have an optional feature called Bid Time Extension which bumps the closing time out each time a bid is placed within the final X minutes of an auction, granting other bidders more time to consider and place bids. It’s an anti-sniping feature so sellers can get a price they deserve and it builds a lot of excitement and tension for everyone, making the whole experience more enjoyable. We should note, however, that we have not received a final confirmation from the seller that the payment has been received. We’re hopeful that payment and delivery of the fursuit goes without a hitch! We have had some considerable challenges in the last few months with “trolls” and other fraudulent accounts as FurBuy’s popularity and activity has grown. So we’ve enacted a new protection for sellers, especially on high-profile or more valuable items, which will help put their minds more at ease. Unrated accounts (new accounts begin as unrated) will no longer be capable of placing bids on more than 5 concurrent running auctions – this prevents what we call “bid-bombing” which is basically a carpet-bombing with bids on numerous auctions on the site with a single account. The second protection is that unrated accounts can no longer place bids that meet or exceed $500 in monetary value – we considered making the limit lower but felt that it would be too heavy-handed to start with, and we may adjust it down in the future based on the results we see in the coming months. All users have a fast and simple way to validate their account which will give them a positive rating and waive these restrictions – they can either send us a State-issued photo ID to prove their identity or send us a small, simple contribution via Paypal to prove their fiscal responsibility. Further, individual sellers can also choose on a case-by-case basis whether to permit an individual user to participate in their auctions by adding the user to their whitelist. Whitelists work by dropping all security restrictions when an account on that whitelist is interacting with the account that has whitelisted it. Users can quickly and easily add and remove other users from their whitelist by visiting the other user’s Profile page. These new restrictions alone won’t completely eliminate fraud and trolling on our system but we believe they will take a huge bite out of issues we’ve seen lately. We are continuing to evolve and develop new security measures, some of which we will be implementing soon. We have also brought on a new administrator and are training them in order to respond in a more timely manner to incidents on the site. Thanks for your time and communications, please continue to keep us informed of any articles or updates you post regarding our system! I find this ridiculous. I don’t understand why anyone would sink that much money into a costume that isn’t even of their own design. I would’ve just kept the money and commissioned my own design from a fursuit maker, which more than likely would’ve been a quarter of the price. I understand she’s a great maker, no put down on her end, but that’s a crazy price. Art prices are in a world of their own and this is showing that furry art is catching up to “real” gallery art. 5-figure prices arent at all out of the ordinary for a serious painting. Why not a fursuit? The reason someone wouldnt just pay less is because they arent looking to shop around for cheapness, they want this maker. I mean you can buy a picasso print or pay a million for the real one, people who have the choice would look at you funny if you told them one is cheaper. They know, that isn’t what they’re looking for.